This very competent Star Wars Story may be more remembered for overcoming bad press than for anything that actually happens in the film. Han’s line, whether it was added just for the trailer or not, would prove to be prophetic as well as sly. After all the behind-the-scenes drama, the tsunami of bad press and off-the-record expectations management from Lucasfilm, Solo: A Star Wars Story is fine. I liked the characters, the dialogue (which Mr. Kasdan co-wrote with his son Jonathan) is crisp, the performances range from solid-to-delightful, the plotting actually makes sense, the main action sequences are staged well, etc. I had a good time. It’s fun. Lightweight, inoffensive fun. 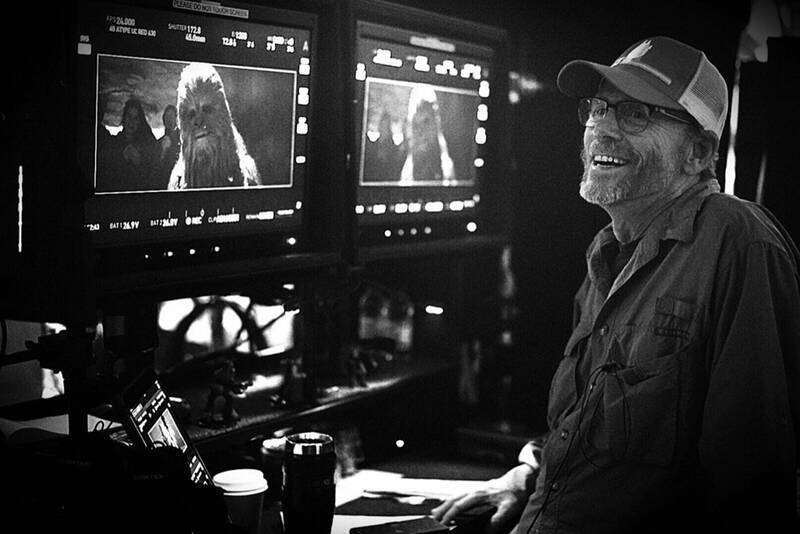 Congratulations are due to Ron Howard, the patron saint of unremarkable competency, who did exactly the job he was hired to do — drag this potential albatross over the finish line — with the bonus of collecting the film’s sole director credit. Lord and Miller have been downgraded to Executive Producers, but like Gareth Edwards and “fixer” Tony Gilroy on Rogue One, we may never quite know what elements of Solo each man was responsible for. The good news, however, is that the film plays seamlessly enough it ultimately doesn’t matter. 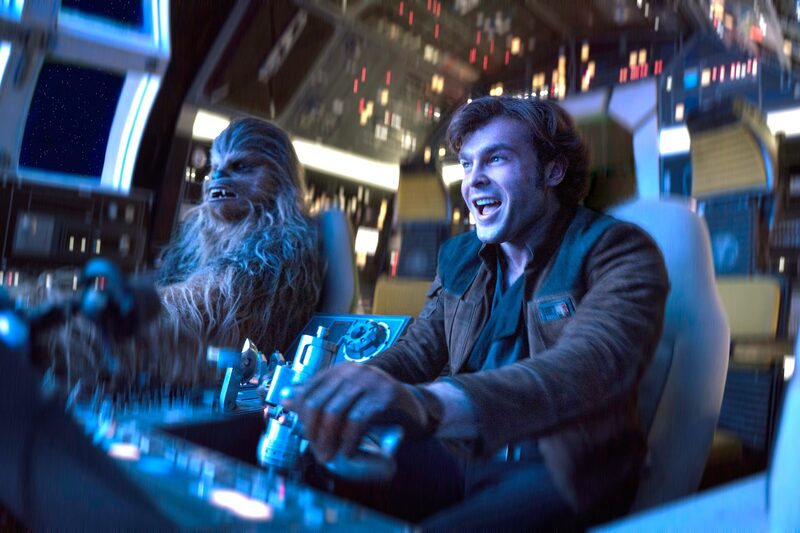 I may already be going too hard on Solo by insisting on evaluating it in the context of the Hollywood machine and not in a vacuum, but in my defense, I come into every modern Star Wars film expecting it to be solid and entertaining. I wouldn’t need to or even enjoy manufacturing reasons to dunk on it. I even spent months on Twitter defending Ehrenreich’s potential performance because of how much I liked him in Hail, Ceasar!, where he showed the charisma and comedic timing he’d need to step into Harrison Ford’s iconic boots. And Ehrenreich (and Howard, I’d expect) is smart enough to know not to just do a Ford impression, though he does adopt a few of his key mannerisms — the posture, the pointing — in what I think is a pretty successful inhabitation of the character. It’s not Ford, but it’s undeniably Han, if a younger version on the path to becoming the Han of A New Hope, before evolving again into the Han of The Force Awakens. After all, if your characters are static over a 40-year saga, they’re not good characters. That brings me to my larger point, which is that a certain subset of fans will love Solo for the same reasons they hated The Last Jedi: it doesn’t challenge your expectations. It delivers precisely the adventure you wanted as a teenager, fan service with a smile, and works its way down a checklist of in-jokes and answers to questions you may or may not have been wondering. “How do Han and Chewie meet?” “How did he win the Millennium Falcon?” “How did he make the Kessel Run in 12 parsecs?” “Where did he get his blaster?” “How did he get…uh, his last name?” Anything that’s not answered here is simply being saved for a sequel (Ehrenreich is reportedly signed on for three films), until every rock is turned over and no mystery remains. A warm nostalgia bath can be nice, until you forget to turn off the faucet and drown. One of the reasons Han Solo burst off the screen was how efficiently the character was drawn. He’s a rogue. A scoundrel. A charmer. You didn’t need to know his childhood backstory to understand him or care about him. Prequel films always have two problems to overcome: how to generate dramatic tension when we already know the ending, and trying not to make characters less interesting the more we learn about them. Solo succeeds on both in part because the tone is light and the stakes are small (is Han the real “Mary Sue?” Discuss), but with the storytelling doors that are opened by the film’s somewhat surprising final ten minutes,* I don’t know how long that will hold. *The ending keys on your knowledge of non-theatrical releases in a way that will be utterly baffling to casual fans. You might only need a Google search to understand how a certain cameo is even possible, but you’re still being yanked out of the film at that moment. 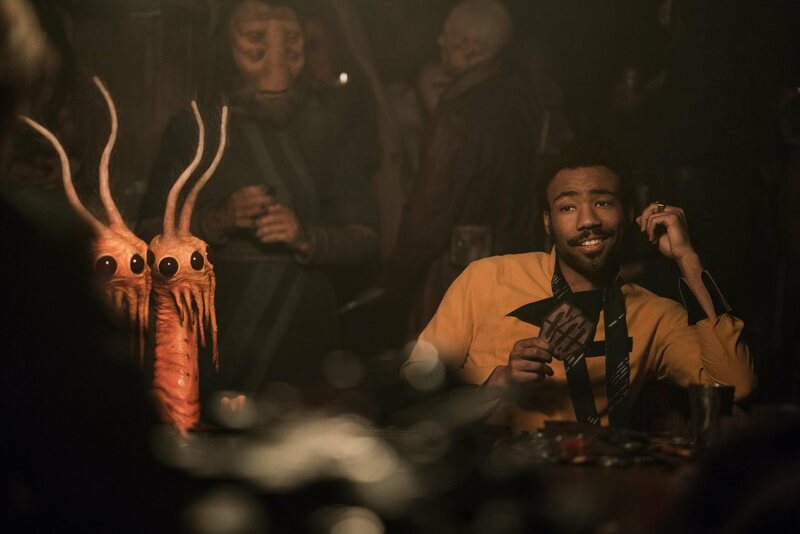 Fortunately, another reason why Solo works is that the supporting cast is as vividly drawn as he is (at least, as presented in this film). 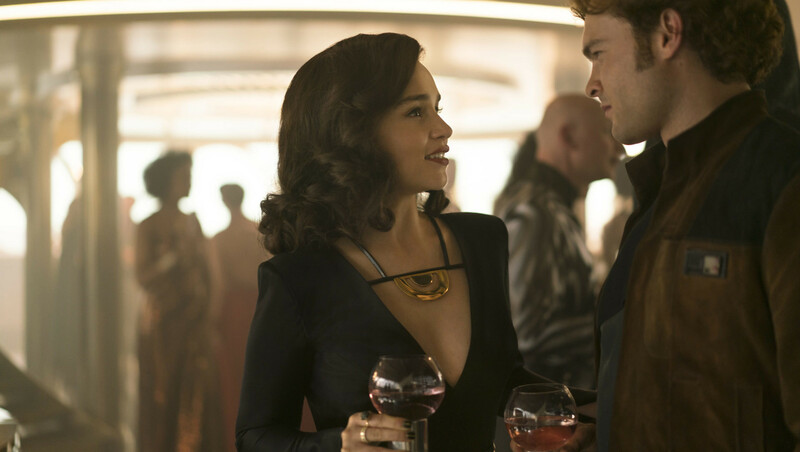 His childhood sweetheart, Qi’ra, is played by Emilia “Daenerys” Clarke, who at first glance seems to be only the latest petite British actress to play a variation on the same character (see: Ridley, Daisy; Jones, Felicity), but the film makes use of her well-honed imperiousness and leaves her true loyalties up in the air all the way to the end. Woody Harrelson is playing the kind of “crusty mentor” he can do in his sleep (and has), but he’s compelling every time he’s on screen. Even Paul Bettany, who only joined the cast in the reshoot stage, is fascinating at Dryden Vos, the dangerous crime boss who sets the “big score” storyline in motion. **Which, I should note, I would only really be excited about seeing if he gets to write it. Oh, and Hiro Murai directs it. People will watch it, Disney. He’s accompanied by his droid co-pilot, L3-37, who’s performed by the delightful Phoebe Waller-Bridge (creator of Fleabag and the Killing Eve series), and isn’t just another wisecracking droid. L3 gets the best running subplot of the film, her quest to free her fellow droids from servitude, which culminates in a thrilling and daffy sequence on the infamous spice mines of Kessel and is one of the rare times you can feel Ron Howard trying to let loose. Look at him let loose! Howard has made a few genuinely great films (Apollo 13, Frost/Nixon, Rush), but many more mediocre ones, and while Solo is far from a disappointment, it’s also hard to look at the overqualified cast and crew and wonder what might have been if the whole film felt as free as it does in the middle third. Gifted cinematographer Bradford Young (Arrival) isn’t afforded many opportunities to be visually distinctive. John Powell’s score is even less memorable, especially compared to the cool synths and guitar that drove the film’s marketing (seriously, I dug it. Why not do that?) The final result, for whatever had to be done to save Solo from disaster, is the most disposable entry in the entire franchise. Unlike the Special Editions, the prequels, or the new trilogy, there’s nothing here even worth fighting about. It does what its hero is famous for never doing: the expected. But I liked it anyway, so screw it. Three stars.